In 326 BC, the Macedonian Empire of Alexander the Great spanned most of what was considered the known world. Maps of civilization sparsely reached beyond the phalanx laced tendrils of Alexander's empire. From Macedonia in Northern Greece to the banks of the Hydaspes River in modern day India, there was no worldly power present that could best Alexander. Alexander was a known conqueror, but there exists--even to this day--a hotly contested debate on his competencies as a statesman. On the very border of the Nanda Empire of India, Alexander stumbled most greatly when his ability to politicize his ambitions was met by mutiny by his own army. Having campaigned for nearly a decade, the Macedonian army was fraught with men who began to know and understand quandaries that a legend of their own literature--Ulysses and his long journey home--had suffered himself: home sickness, campaign fatigue and demoralization. The men under Alexander had marched over fifteen hundred kilometers from Pella in Macedon to the very border of India. Imagine setting out from Los Angeles on foot, your destination: Dallas. This is the burden of the Macedonian soldier under the Lion of Macedon. The campaign in India faltered at the behest of men weary of combat and perhaps the realization that the man they followed carried with him an endless ambition. "Just one more empire," you could imagine Alexander shouting to the assembled ranks of his men. "Just one more empire and we'll turn back." There would be no turning back. Scholars who were present during Alexander's campaigns in Persia allude to the idea that Alexander believed the fathomed "end of the world" rested on the opposite edge of India's great mass. It can be said with some admirable clarity however that once he realized he was wrong, he might've shrugged his shoulders and ordered his men further on. Just one more empire. Not only were these men left longing for their wives, sons and brothers at home, Macedonian scouts had returned from the further Ganges river with reports of armies under the Nanda Empire awaiting them. Two hundred thousand infantry, eighty thousand horsemen and four thousand war elephants. The forty-thousand man Macedonian Army had no hope to defeat such a vast foe. The reality is that Alexander was presented with only one option when his men threw down their arms at the banks of the Hydapses: relent. Without an army, Alexander was no conqueror, no champion, no son of Zeus. If ever Alexander possessed a heel akin to the legendary hero Achilles, it was the loyalty of the Macedonian Army. A Macedonian general, Coenus, was allegedly one of the more prominent proponents for turning back and returning home. So bold was Coenus' speech, Alexander agreed that the campaign would end in India. But what if such fate had been kinder to Alexander's ambitions? Coenus was a reliable commander of one of Alexander's distinct phalanxes. Imagine instead that Coenus falls in battle, either at the Hydaspes or in a previous battle against the Achaemenid Empire. His absence will cast the mutinous lot without a distinct voice to reason with Alexander. Consider this second--albeit less important point of divergence: the Battle of Hydaspes goes entirely in the favor of Alexander the Great. This feat is more probable than Coenus' unlikely death. 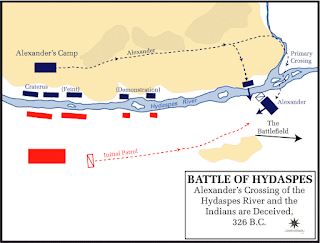 The Battle on the Hydaspes River was the most brutal of Alexander's entire campaign, with an entire thousand men dead. Considering modern bouts such as Stalingrad and the Somme, a thousand dead seems a pittance. Even in stark comparison to similar ancient battles of Cannae and Lake Trebia (both stunning victories by the Carthaginian general Hannibal), a thousand dead might be at very best an expectation. No, these kind of casualties gave very genuine concern to the average foot soldier in Alexander's comparatively sized field army. Outnumbered three to one, Alexander faced off against an army--like the Persians--that was under armored, under equipped and intending to use overwhelming force to win the day. Against the long reaching sarissas of the phalanx, it was only a matter of time before they broke. Porus, the king of the Paurava Kingdom that called the Hydaspes River home, was captured. His two sons, his uncle Spitakes and the majority of his commanders were killed. Over 12,000 Indians met their end with almost an equal amount wounded. The Macedonians were victorious, but it had been earned. The Indians utilized mighty elephants, clad in armored harnesses that often deflected javelin and arrow shot. The Indians fought with tenacity and were led by men that did not flee at the first sign of defeat. Plutarch later said this of the Macedonians' perspective after the battle had been won: "But this last combat with Porus took off the edge of the Macedonians' courage, and stayed their further progress into India. For having found it hard enough to defeat an enemy who brought but twenty thousand foot and two thousand horse into the field, they thought they had reason to oppose Alexander's design of leading them on to pass the Ganges, too, which they were told was thirty-two furlongs broad and a fathom deep, and the banks on the further side covered with multitudes of enemies." Had the casualties been lessened, had a more complete victory been won, could Alexander have convinced the men to forge on into the Indian subcontinent? 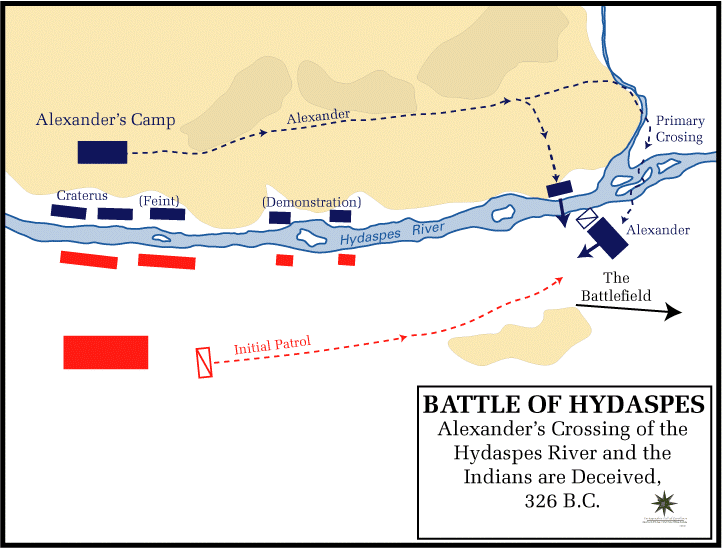 Those unfamiliar with India's daunting history must be reminded here that a mere five years following Alexander's victory at the Hydaspes, the Nanda Empire which sought to oppose Alexander at the Ganges, fell apart completely. Alexander, with at best a reluctant army, would cross the Hydaspes and make way for the Nanda Empire. The last great foe before reaching the proclaimed "end of the world." The climate of India, a world the likes a Macedonian would have never seen before, might very well become a much more sinister opponent than any Indian army. Thick foliage, flora and fauna so exotic as to be considered alien, and treacherous hazards in the form of razor sharp rocks embedded in deep valleys, jungles so thick to only allow a single man to cross at a time and insects aplenty. Considering the suffering Alexander's army took through attrition just in returning through the Geodrosian Desert, it's likely he would have suffered similar casualties in a world so distinctly different than the one he was familiar with in the Greek Peninsula and Anatolia. Militarily, he would have been up against the most terrible armies mustered so far. Historians quote that the Nanda Empire could field over four thousand war elephants, though it's unlikely they could have brought them to bear all at once. Alexander dealt with some forty at the Hydaspes, harassing them with the sarissas of his phalanxes while killing the mahouts who kept the animals under control. Whether or not he could replicate this is uncertain. How many more battles Alexander would have to win before the Nanda Empire crumbles is the question that determines whether or not Alexander succeeds. Already close to collapse, the Nanda Empire possessed the bottomless manpower to go toe to toe with Alexander, lose battle after battle and remain afloat--if only for a little while. Unfortunately for us--and perhaps thankfully for Alexander--a man named Coenus, on the banks of the Hydaspes in the summer of 325 BC, wasn't to let it be so. "Those unfamiliar with India's daunting history must be reminded here that a mere five years following Alexander's victory at the Hydaspes, the Nanda Empire which sought to oppose Alexander at the Ganges, fell apart completely." This is completely incorrect, the Nanda empire did not "fall apart completely". Rather, after a coup of some kind, it was taken over by the Indian adventurer Chandragupta Maurya, who supplanted the last Nanda ruler as Emperor. Chandragupta had, apparently, earlier carried out some sort of partisan warfare against the Macedonian regime, killing some of Alexander's generals and satraps.